Team Italia catcher Drew Butera is ready for the 2017 World Baseball Classic. Royals catcher Drew Butera caught the final strike thrown by reliever Wade Davis to capture the 2015 World Series crown. Known best for his excellent defensive prowess and as a pitcher’s catcher calling games behind the plate, Drew Butera has been experiencing an offensive renaissance for the 2016 Kansas City Royals. Making the most of his 47 at-bats, the 32-year-old Italian American is hitting .298 with six doubles, two homers, four walks and eight RBI. Royals manager Ned Yost has rewarded Butera with more playing time this season by putting regular backstop Salvador Perez in as DH. The Florida-native is the son of Sal Butera—a journeyman catcher who played 359 MLB games for the Blue Jays, Twins, Reds, Expos and Tigers from 1980-1988. Drew was selected by the Blue Jays in the 2002 MLB Draft but instead opted to play at the University of Central Florida. After throwing out 48% of potential base-stealers and hitting .325 in his last season at UCF, Butera was a 2005 fifth-round draft pick by the NY Mets. 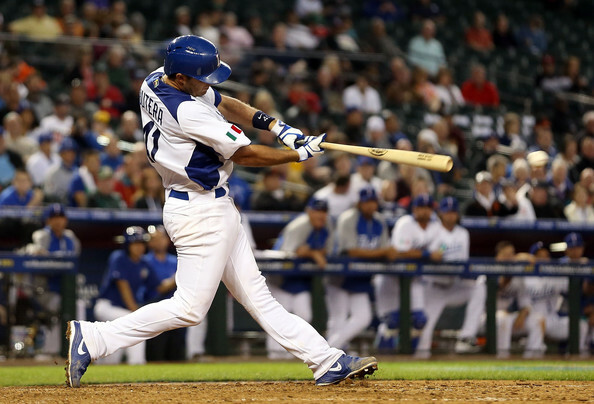 Drew Butera was a strong source of power for Team Italia in the 2013 World Baseball Classic. 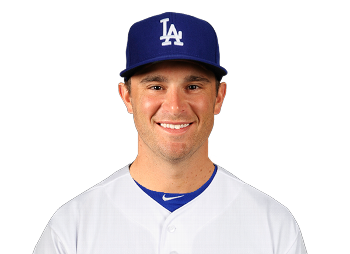 Drew Butera played in LA for both the Dodgers (2013-14) and Angels (2015). A big opera fan who used to listen to Andrea Bocelli and Luciano Pavarotti in the clubhouse before games while in the Mets’ minor league system, Drew was named Florida League All-Star and subsequently promoted to AA in 2007 before being traded to the Twins—where Butera family history was made as Sal and Drew became the first father-son combination to play for Minnesota when he made his MLB debut on April 9, 2010. Being able to handle pitches with grace rarely seen at the Major League level while producing a calming effect on his pitching staff, Drew Butera kept lefty Francisco Liriano focused on every pitch which led him to a no-hitter against the Chicago White Sox on May 3, 2011. While playing for the Los Angeles Dodgers on May 25, 2014, Butera caught Josh Beckett’s no-hitter against the Philadelphia Phillies and became only the fifth catcher in Major League Baseball history to catch a no-hitter in both leagues. Butera was a big hit for Team Italia in the 2013 World Baseball Classic. Delivering a two-run home run that helped defeat Mexico and a two-run double that buried Canada, Drew was instrumental in each of Team Italia’s victories to earn la squadra Azzurri the right to advance with Team USA to the second round of play. Tried and tested as “Azzurri” teammates on Team Italy in the 2013 World Baseball Classic, utility infielder Nick Punto and backup catcher Drew Butera quite naturally bleed Dodger blue. Butera was reunited with Team Italy leadoff hitter Nick Punto when he was traded to the Los Angeles Dodgers on July 31, 2013. Destined to get the most from one of MLB’s finest pitching staffs, Drew is a valuable asset to the dream team of Dodger General Manager Ned Colletti. 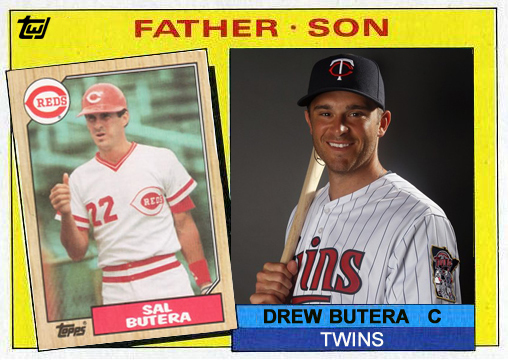 Born on August 9, 1983, the Florida-native is the son of Sal Butera—a journeyman catcher who played 359 MLB games for the Blue Jays, Twins, Reds, Expos and Tigers from 1980-1988. Drew was selected by the Toronto Blue Jays in the 2002 MLB Draft but instead opted to play college ball at the University of Central Florida (UCF). 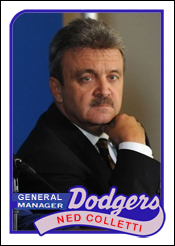 Ironically, father Sal now works as a scout for the only Canadian MLB franchise. Los Angeles Dodgers’ recent acquisition, star backup catcher Drew Butera will prove to be worth his weight in gold during the postseason run to the World Series. After throwing out 48% of potential base-stealers and hitting .325 in his last season at UCF, the right-handed catcher was a fifth round pick by the New York Mets in the 2005 MLB Draft. 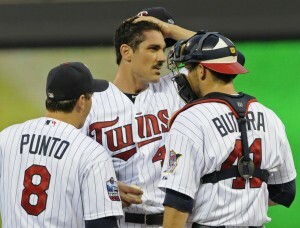 Nick Punto, Carl Pavano and Drew Butera in 2010.
to handle pitches with grace rarely seen at the major league level, he became the exclusive catcher for Carl Pavano. Having a producing a calming effect on his pitching staff while calling a great game from behind the plate, Butera kept Francisco Liriano focused on every pitch which garnered the lefty a no-hitter against the Chicago White Sox on May 3, 2011. Known as a pitcher’s catcher, Drew even went as far as taking the mound to throw a scoreless inning (including a strike out) against the Brewers in 2012. Team Italy catcher Drew Butera and coach Frank Catalanotto at Chase Field in Phoenix, Arizona. Drew Butera was a big hit for Team Italy in the 2013 World Baseball Classic. Delivering a two-run home run that helped defeat Mexico and a two-run double that buried Canada. Butera was instrumental in each of Team Italy’s victories to earn the team the right to advance with Team USA to the next round of play in Miami. Dodger teammate Nick Punto was just as important in the WBC. Punto led off in every one of Team Italy’s five games and raked at the plate (.421 batting average, 8-for-19, two doubles, two walks and five runs scored). Both players along with Joe DiMaggio, Phil Rizzuto, Tony Lazzeri, Roy Campanella, Yogi Berra, Ernie Lombardi, Ron Santo, Tommy Lasorda, Tony Conigliaro, Craig Biggio, Tony La Russa, John D’Aquisto, Ken Caminiti, Mike Piazza, Frank Catalanotto, Joey Votto, Jason Grilli, Anthony Rizzo, Chris Denorfia, Dan Serafini, Alex Liddi, Chris Colabello, Brian Sweeney, Mike Costanzo and Reid Rizzo are featured in the Artists’ Tribute to Italian American Baseball Exhibit at Convivio, 2157 India Street in San Diego. Artists’ Tribute to Italian American Baseball showcases original artwork, photographs, uniforms, articles, and other related artifacts related to baseball players of Italian descent and those with strong ties to San Diego. Works by nenowned Italian American artists Christopher Paluso, James Fiorentino, Vincent Scilla, Professor John Giarrizzo, Warren Reed, Zack D’Ulisse, and Rob Monte will be on display alongside sports artists Chris Felix, Vernon Wells, Jr., and Jeremy Nash at the Little Italy Heritage Museum at Convivio Center. For more information on the exhibit and special events–including player and artist appearances, visit www.ConvivioSociety.org or phone 619-573-4140. LA Dodgers’ catcher Drew Butera has been known to surprise pitchers with his pop at the plate.